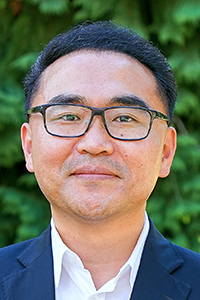 Seungahn Nah joined the University of Oregon in July 2017 as Professor and the new Associate Dean for Gradudate Affairs and Research after spending 11 years at the University of Kentucky, where he was an associate professor of community communication in the Department of Community and Leadership Development, as well as Information Communication Technology in the School of Information Science. He received his PhD from the University of Wisconsin-Madison and his master’s and bachelor’s degrees from Yonsei University, Seoul, South Korea. He is founding director of the University of Kentucky’s Community Communication Research Group and the Kentucky Citizen Media Project, which initiated its first community-based citizen journalism news site or the Lexington Commons in Lexington, Kentucky. He currently directs the Digital Media and Civic Engagement Project, nationally and globally. He has produced more than 50 journal articles and book chapters in leading communication and journalism journals. With regard to grants, he has acquired numerous funding to support his research and teaching from New Voices through the Knight Foundation and the National Science Foundation, among others. He is a recipient of numerous top paper awards from the Association for Education in Journalism and Mass Communication, the International Communication Association, the American Political Science Association, and the World Association of Public Opinion Research. He is also a recipient of the University of Kentucky Provost’s Outstanding Teaching Award. He was a fellow of the Academic Leadership Academy and served as head of the Mass Communication and Society Division of the Association for Education in Journalism and Mass Communication. Currently he is an associate editor of the journal Mass Communication and Society and serves as president of the Korean American Communication Association. Nah, S. & Chung. D. Understanding citizen journalism as civic participation (forthcoming 2019). Routledge, Taylor & Francis. Nah, S. & Yamamoto, M. (forthcoming). The Integrated Media Effect: Rethinking the Effect of Media Use on Civic Participation in the Networked Digital Media Environment. American Behavioral Scientist. Liu, W., Chen, N.-T. N., Ball-Rokeach, S. J., & Nah, S. (forthcoming). Connecting with Hyperlocal News Website: Cause or Effect of Civic Participation. American Behavioral Scientist. Liu, W., Son, M., Wenzel, A., An, Z., Zhao, N., Nah, S., & Ball-Rokeach, S. J. (2018). Bridging Mechanisms in Multiethnic Communities: Place-Based Communication, Neighborhood Belonging and Intergroup Relations. Journal of International and Intercultural Communication. Online First Published. Kim, Y. & Nah, S. (2018). Internet Researchers’ Data Sharing Behaviors: An Integration of Data Reuse Experience, Attitudinal Beliefs, Social Norms, and Resource Factors. Online Information Review. Online First Published. Nah, S. & Yamamoto, M. (2018). Communication and Citizenship Revisited: Theorizing Communication and Citizen Journalism Practice as Civic Participation. Communication Theory. Online First Published. Yamamoto, M. & Nah, S. (2018). A Multilevel Analysis of Individual-and Community-Level Sources of Local Newspaper Credibility. Journalism and Mass Communication Quarterly, 95(1), 76-95. Nah, S. & Yamamoto, M. (2017). Civic Technology and Community Building: Interaction Effects between Integrated Connection to a Storytelling Network (ICSN) and Internet and Mobile Uses on Civic Participation. Journal of Computer-Mediated Communication. Online First Published. Yamamoto, M. & Nah, S. (2017). Mobile Information Seeking and Political Participation: A Differential Gains Approach with Offline and Online Discussion Attributes. New Media & Society. Online First Published. Yamamoto, M., Nah, S., & Chung, D. (2017). U.S. Newspaper Editors’ Ratings of Social Media as Influential News Sources. International Journal of Communication, 11, 684-700. Chung, D., Nah, S., & Yamamoto, M. (2017). Conceptualizing Citizen Journalism: U.S. News Editors’ Views. Journalism: Theory, Practice, & Criticism. Online First Published. Namkoong, K. Nah, S. Record, R., & Van Stee, S. (2017). Social Media Campaign Effects: Moderating Role of Social Capital in Anti-smoking Campaign Communication. Health Communication. Online First Published. Nah, S. & Chung, D. (2016). Communicative Action and Citizen Journalism: A Case Study of OhmyNews in South Korea. International Journal of Communication, 10, 2297-2317. Namkoong, K., Nah, S., Van Stee, S., & Record, R. (2016). Communication, Reasoning, and Planned Behaviors: Unveiling the Effect of Interactive Communication in an Anti-Smoking Social Media Campaign. Health Communication, doi: 10.1080/10410236.2015.1099501. Nah, S., Namkoong, K., Chen, N.-T. N., & Hustedde, R. J. (2015). A Communicative Approach to Community Development: The Effect of Neighborhood Storytelling Network on Civic Participation. Community Development: Journal of the Community Development Society, 47(1), 11-28. Nah, S., Oh, P., & Yoon, Y. (2015). Press-Party Parallelism Regarding ‘Openness of Agriculture’ During Three Political Regimes (1993-2008) in South Korea. Asian Communication Research, 12(1), 5-36. Nah, S., Yamamoto, M., Chung, D., & Zuercher, R. (2015). Modeling the Adoption and Use of Citizen Journalism by Online Newspapers. Journalism and Mass Communication Quarterly, 92(2), 399-420. Nah’s research centers on the interrelationships among communication, community, and democracy, with special emphasis on the roles of digital communication technologies in community and democratic processes and outcomes. His work has appeared in such leading journals as Journal of Communication, Communication Theory, Journalism and Mass Communication Quarterly, Journal of Computer-Mediated Communication, New Media & Society, Mass Communication & Society, International Journal of Communication, Javnost-The Public, Journal of Broadcasting & Electronic Media, and Journalism: Theory, Practice and Criticism among others. Top Poster Award, Journalism Studies Division, International Communication Association (ICA), Fukuoka, Japan, 2016; * Top Paper Presented for Journalism Studies Division’s Poster Session.